As head of security, Fuzz has decided to hire Rosy as Dad's night bodyguard. She is really good at her job. She lays down at the foot of the bed while Dad sleeps. If she hears any noise, she will bark. If anyone tries to come near him she growls and shows her teeth. So now, Fuzz can take off at night and sleep soundly knowing that the job is handled. Good hire Fuzz! On my walks, I get to see so many pretty color trees. Mom and Dad love the red and orange ones. But yesterday, Mom was inspired by the golden color ones to take some pictures of me (it doesn't take much to inspire her to get the camera). Anyway, she made me pose in a big pile of golden leaves covering the street. Click. Click. Click. So here I am. 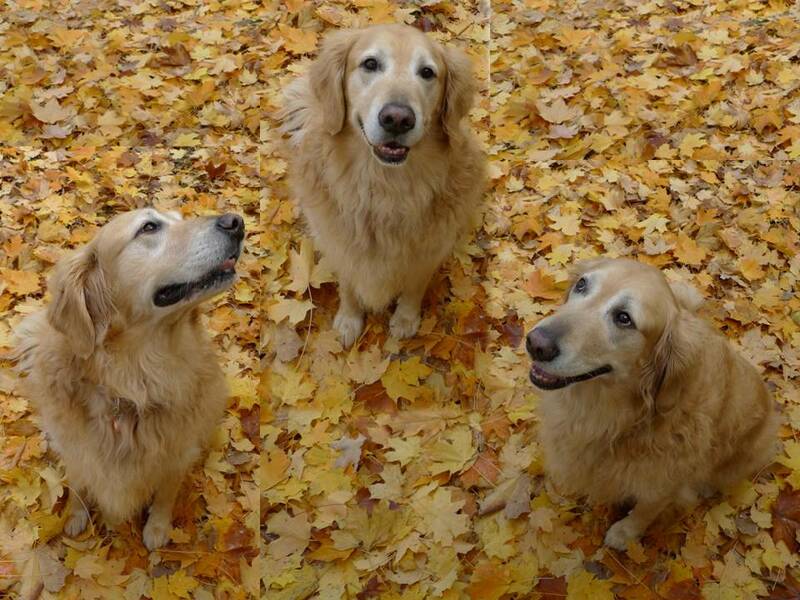 A Golden on Golden Pile. Every Sunday Mom and Dad watch Boardwalk Empire. They really love the show. So it got me to thinking. What if I had lived in the 1920's? I wouldn't have cared about prohibition cause I don't drink. But would I have been a mobster? 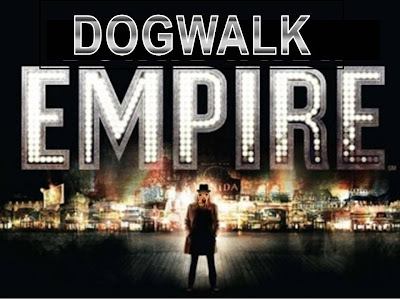 Would I have worked for someone like Nucky Thompson? Or would I have been a powerful kingpin myself? Hmmm... Bear's DogWalk Empire. Doesn't that sound swell? My walks this week were extra fun with Sydne and BunnyBell. All of us would go walking together like a real pack. We always start with Fuzz deciding on the route, Rosy running up in the lead, BunnyBell lagging behind, and me following along in the middle. 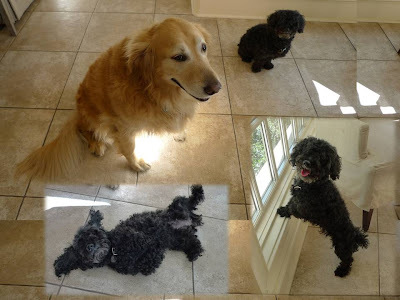 But now we are back to three again since Sydne and BunnyBell went back to California yesterday. I am sad because I don't think I will see them again until the Spring. Maybe I will suggest to Fuzz that we walk West headed toward California. I wonder how long it would take to get there. This week I got to spend time with my human sister Sydne who is visiting from Los Angeles. I really like her. Yesterday she was wrestling with me. Rosy came around barking cause she was afraid I was going to eat Sydne. I tried to explain that we were just playing. After all the play and barking, Sydne and I got tired and took a nap. Life is good, especially with Sydne here. Maybe I could keep her as my full time sister and send Rosy to L.A.
Today is Thanksgiving in America. Fuzz and I have a lot to be thankful for. We are thankful for our forever family who we love so much, especially eachother since we became brothers this year. We are thankful that we are so well taken care of. We are thankful for all that is given to us. 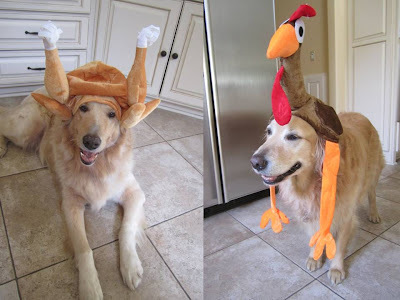 Well, maybe except for these turkey hats. Growing up in Southern California, I did not experience seasons like I have in Memphis this year. I never really understood why Autumn was also called Fall. It is the only season I think that has two names. But now I get it. It is Autumn now, and everyday more and more leaves fall, hence, the name Fall. Pretty clever. I wonder what the nickname of winter is or should be... Freeze? And then should Spring also be called Thaw? And Summer also be referred to as Perspire? 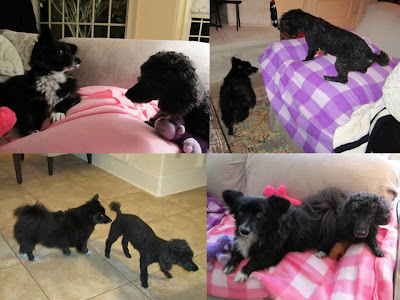 With my niece Bunnybell here visiting, there are now 2 big boy and 2 little girl dogs in my house. And wow, do gender and size ever so make a difference. Those two little girls pitter patter around, bicker, instigate, jump up and down on furniture and compete for laps and chairs. This is so unlike me and Fuzz. We're just chill. We take life as it comes. Thank heaven I'm not a little girl. It seems way too stressful. Just when I was finally starting to get used to the idea of being a three canine house, my human sis arrived with her dog/my niece Bunnybell for a visit. So now we are four, plus three humans. This change has had quite an impact on my life. For example, my sleep is interrupted, I get less ball time and I need to share my Mom with yet another dog, But I am not complaining. I love and am thankful for Rosy and Bunnybell and of course I adore Sydne . But I will admit it. I do find myself occasionally longing for the more simple moments of me and Fuzz and Mom and Dad. 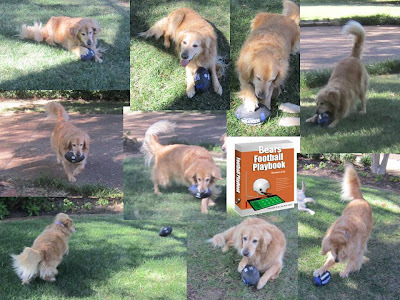 When my Mom gave Fuzz and I a football, I decided I would want to be a quarterback since everyone tells me I am smart and I don't like to tackle others. So I went outside and practiced based on what I saw on TV. But I realized I needed to learn more. I wonder if I could buy a Bears Football Playbook. Maybe my family in Chicago could get it for me. I CANNOT believe we missed an important holiday! We just learned that November 15th was National Clean Out Your Refrigerator Day. Fuzz asked Mom if maybe there was a make up day. I am wondering if there is a National Clean Out You Freezer Day. That would be even better cause that is where the meat is. Well, if there isn't an official one yet, maybe I could set it for tomorrow? Do I need to get a petition going? Rosy doesn't do much but lay on her pink blanket and look pretty. Bear explained that she has to rest because she had surgery. He reminded me that I lay around a lot and do nothing and I have no excuse. Anyway, I don't think Rosy likes me. She growls when I come near her. She thinks I am going to eat her. I would not eat her, maybe her food, but not her. In fact, I actually like having her around. Whenever she gets a treat, I get a treat too cause Mom likes to treat all of us the same (no pun intended). Lately, we have been taking off leash walks on the golf course in the evening. As part of the walk, Mom always throws a stick for Fuzz and I to catch. Fuzz is only interested in the same stick that I am. So we always end up playing Tug of Stick. Even though he is bigger, I usually win. And then I carry the stick home. Mom makes me leave it outside the door. I am starting to build up a collection. Maybe we can use it for firewood.For the money that saves the family, maybe I could have that as allowance. I am so enterprising. Poor Rosy. She just lays all day recuperating on her blanket (now she has a blanket collection). Mom just can't help herself. Click, click, click with the camera. I warned Rosy that she just has to get used to it. Well it didn't take Rosy long. She already poses for Mom. I think Tyra Banks calls it smizing with her eyes at the camera. America's Next Top Modoodle? The other day, Mr. Joe Zee, (Creative Director for Elle) tweeted that he didn't understand a trend a guy was wearing. I actually thought it was brilliant. 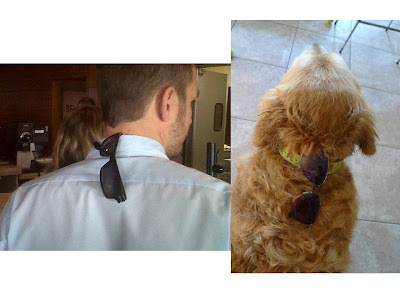 If I wore sunglasses and wanted to take them off to eat or play ball, I could not put them in front on my collar, cause they would get in the way. So putting them in the back on my collar is just perfect. Plus, it makes me very stylish wearing the latest trend. Since Fuzz works for me as Director of Security for Mom's company, I asked him to take a look into any possible improvements in the process. So Fuzz started the Fuzz Bureau of Investigation (FBI). He then suggested that since I was the smartest, I should start the Cuddly Intelligence Agency (CIA). So now we have a heightened level of security. Good work Fuzz! 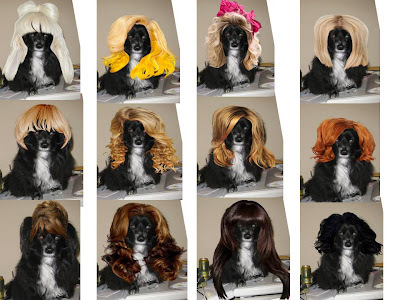 I saw this thing on InStyle.com that lets you see what you look like with different celebrity hair. Well, there were no boys, so I didnt want to try it myself. But Bunnybell (my neice) was game. She looks so good as so many different celebrities! Which do you like best? BunnyGaga (white)? BunnyGaga (yellow)? BunnyJessicaParker? BunnyPaltrow? BunnyJ. Blige? BunnySwift? BunnyAnniston? BunnyHendricks? BunnyPalin? BunnyKnowles? BunnyKardashian? or BunnyHayek? Mom brought Rosy back home yesterday after her lady surgery. She has to be resting quietly and not bother her boo boo. So last night I thought I would help by watching her. She seems to be getting more comfortable with me, or maybe it was her pain medication. Fuzz didn't really care until Mom started feeding her chicken. That made Fuzz watch her too. Then he got a treat and went back to sleep. I kept watching her. After all, I am now her big brother and need to love and protect her. Mom got me and Bear a University of Memphis football. 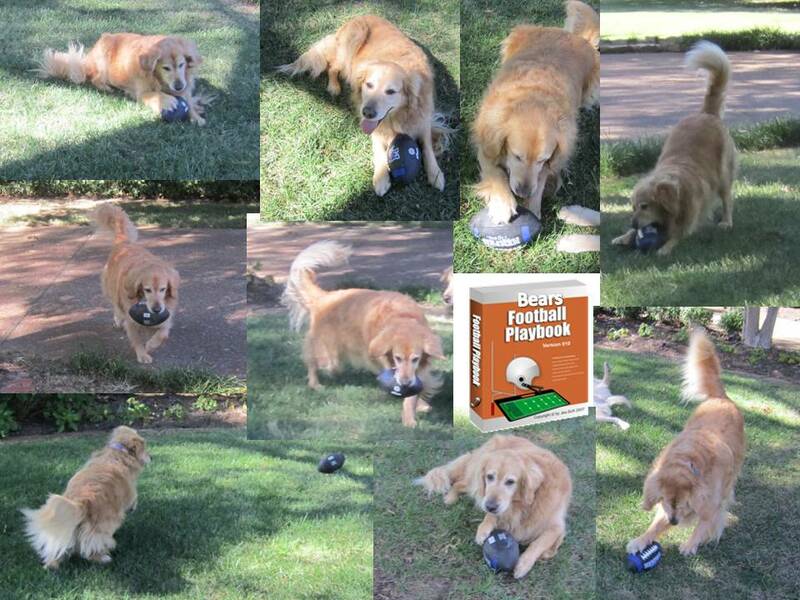 We played a bit with it, and Bear thinks I have promise as a football player. He said if I go anywhere near the opposing team with my teeth, they will retreat and I could catch the ball. So I guess I would be a receiver. Since I live nearby the University, maybe I will walk over and see if I could join the team. There are a few times in a day that I really want something. One, is when I want to play ball. The other is when I want a treat, which is more often now that I am on a diet. So I started practicing my irresistible faces. Those that my Mom and Dad just absolutely can not refuse. I think I almost got it down pat with this one. Don't ya think? Well, Rosy is still with us. Yesterday she had her spa day. When she came back, I didn't even recognize her. 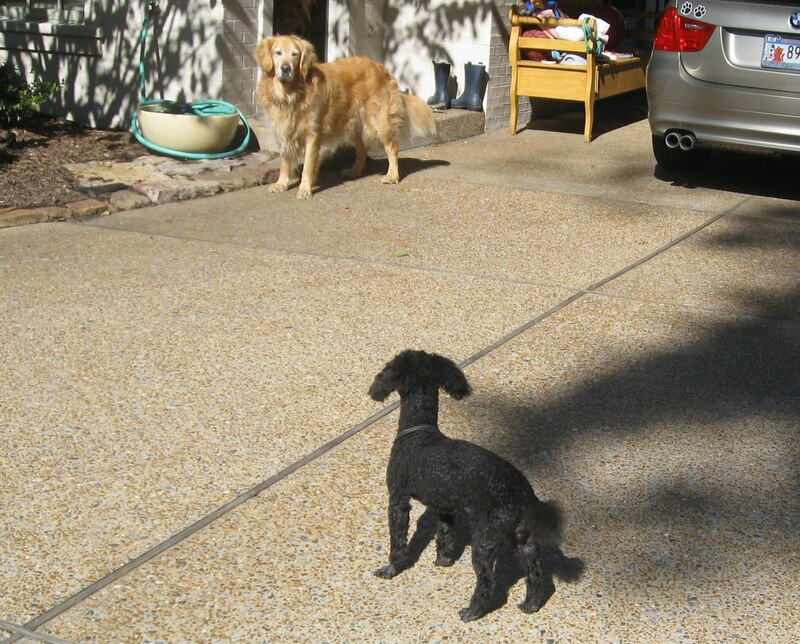 I said, Mom, "Who is that poodle? Where is Rosy?" Well, under that mop of scraggly fur, there was a toy poodle. I wonder what would happen if I went to the groomer and got my fur cut, do you think I would be a yellow lab? 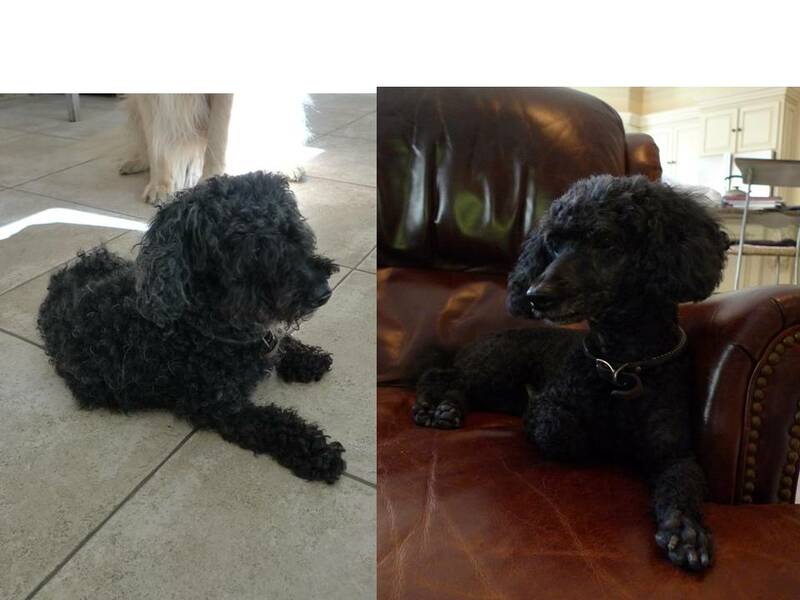 This past Saturday, we found a little black dog with a collar and no tag. Mom & Dad put up lots of signs. No one has called. Mom said we needed to name her in the meantime. We named her Rosy because we found her on Rose St. Today Mom is taking her to the vet to have her checked out. I cant decide whether I like having her around. On the one paw, she is very attached to my Mom which makes me a bit jealous. On the other paw, it would be nice to rescue an abandoned dog. Fuzz also pointed out that maybe with a sister, it would help take some of the dress up pressure off of us. He has a point. I am sure Mom has photo shoots in her head! Stay tuned. I heard Mom talking to Dad on Friday about getting two more dogs. I told Fuzz. We were very excited. We were wondering when they were coming, whether they would be big or small, male or female, and on went our questions. Next thing we know, Mom opens the back door and calls us to look at our new dogs. We ran over to the white dogs that looked a little like us. Ugh. They were made of concrete. Bummer. Mom said that we could each name one. Great. How about Con and Crete? The other day, Dad wanted to take a picture of Mom and Fuzz and me. I thought that it would be nice to put in my blog since Mom never appears. So there we were about to take a really nice picture. But at the very moment of the click, Fuzz turned his head and covered Mom's face. Fuzz told me later that Mom bribed him to do that with a promise of a cookie. I guess she wants to continue to be Mystery Mom to the world. 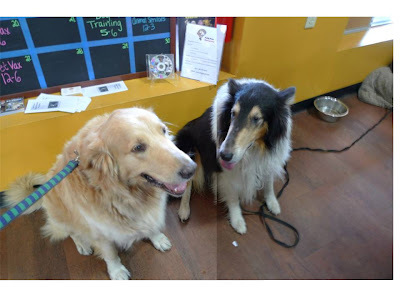 The other day we went to Hollywood Feed pet store and I met Shadow the Collie. He told me I looked like a Collie, but he had never seen a collie with my color fur. I told him that is because I am a Gollie, not a Collie. He said I looked and acted very much like a Collie which he said was a huge compliment. He thought maybe we were cousins. I said we should start a cousins club. Of course, Bear felt left out. So I told him he could be part of the club too. Mom came home with this tall striped hat and I asked her what it was. She told me it was the hat from the Cat in the Hat stories by Dr. Seuss. She then showed us the books. Since she did not have The Cat in the Hat, Fuzz wanted to read Green Eggs and Ham. I told him that may make us hungry so I chose Fox in Socks. We found the book to be very odd but the rhymes inspired me to try it myself. What should I write, write in my blog? Put it on , put it on! It will help you write! But this hat, this hat is so tall! Never mind this...just throw me a ball. My Dad really doesn't like to do costume things. That is why I was really surprised when I saw him in the hot tub wearing the same bat headgear as me. Now, it was Halloween, so I guess that is a slight explanation. Maybe he did it to make Mom laugh. But I would rather believe that he did it for me. I was just so touched that he wanted to be like me! Throw that ball BatDad! Mom and Dad went on a trip to Washington DC and brought Fuzz and I home stuffed toys. I had first choice. So there I was with a red elephant or a blue donkey. This was really tough. I had a funny feeling which my Dad would want me to pick. I know my President would want me to pick the Donkey. But I think my new state would prefer I chose the elephant. Now I understand why politics is so hard. You just cant please everybody. I never want to be a politician. This morning on my walk I saw a horrible thing. It was a witch that had flown into a tree. My mom told me not to worry, cause she was probably a bad witch. I don't know how she came to that conclusion. In my blog, a witch that flies into a tree is not necessarily bad. She is either blind, not too smart, or a bad broom driver. Poor witch.